The drawing that I eventually labelled “The Monster” was the start of a new phase. I had met my wife over the summer of 2012 and after a few months of not thinking about the Singing Bone at all, the story came back into my consciousness as something I really wanted to work on. I was not living at home at this point and it had it’s advantages: I did not have access to my computer as much, so overly retouching the drawings in Photoshop was not an option. If I did not like something, I would need redraw it by hand. 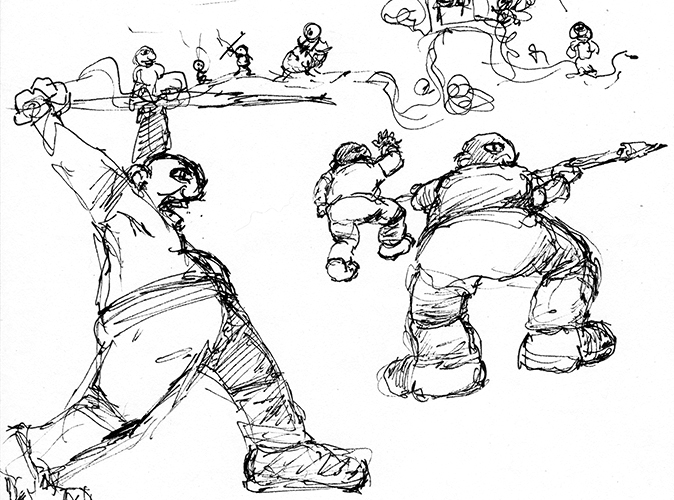 This was of crucial importance as this drawing marks the start of relying less on Photoshop. Also, I had addressed some of the issues that the earlier drawings had. Now, the panels were active and relating to each other and the characters are committing to their feelings. Comparing the 3 panels above (the old version) with the 3 panels below, I wanted to show the wild boar as a threatening creature, something that I failed to do in the original. I also wanted less storytelling gaps between the panels, so more panels would need to eventually come in between those that I already created to better tell the story. Every time I reached a point when I thought I was finished with the story, I saw how much more work still needed to be done in order to get the results I was hoping for. I kept starting over. 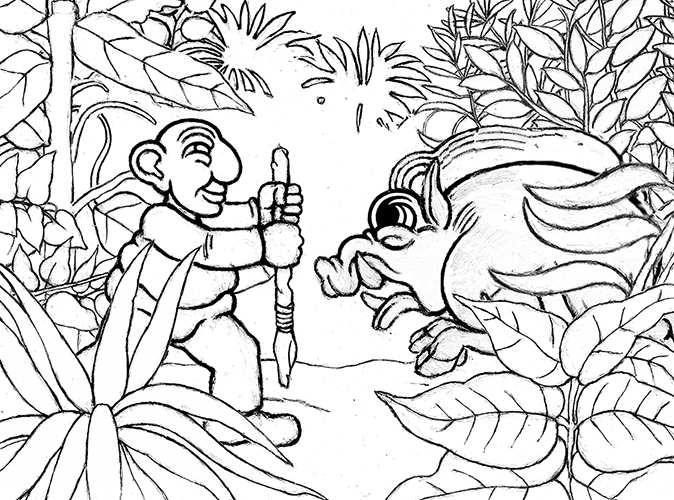 In this case, by focusing most of my attention on the villagers fleeing from the wild boar, I was free from from the constraints of continuing to redraw the same characters over and over. I was now enjoying the freedom of focusing on new faces and it helped me to push myself further. Still, it was clear that it was not enough. 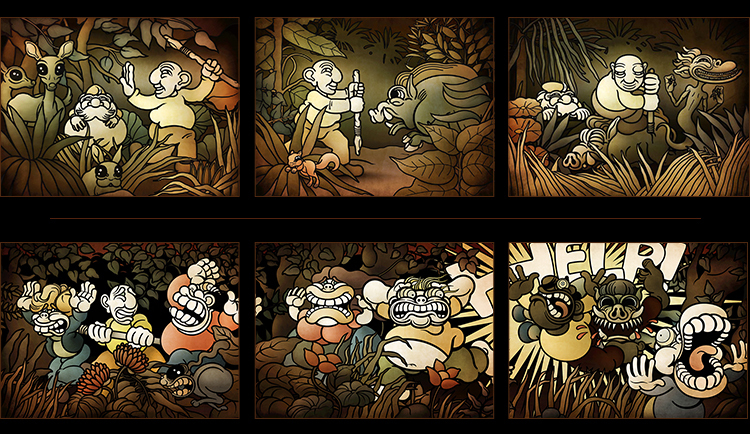 The new drawing I had done with the fleeing villagers had opened my mind to new possibilities, but I needed to take this further if it was going to work. I love art history and once in a while there are certain poses that I inspire myself from that lend themselves well to a scene that I’m creating. 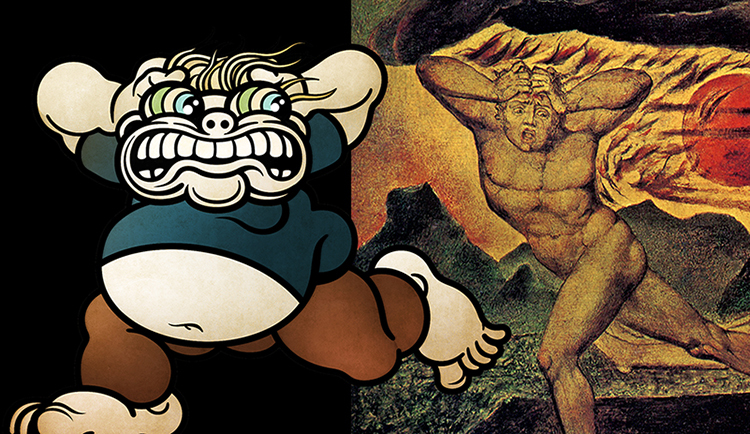 In this case, it was an old drawing by William Blake that was of great help. I spent most of my christmas vacation trying to finish a drawing for the Thought Processor… a drawing that I have disregarded since then. I often refer back to moments like this before starting a project. I carry anxiety when I contemplate all of the time that I will potentially spend on something because of the time that will be taken away from other things, and in the end I might have not to show for it at all. It has not stopped me from going forward, of course, but there is always an awareness that weighs on my conscience. After a year and a half of work, I had only four drawings to show for it. Of course, I was not working on the project full time, but I was moving way too slowly and this was due to my inability to let go of small insignificant details and trust myself. 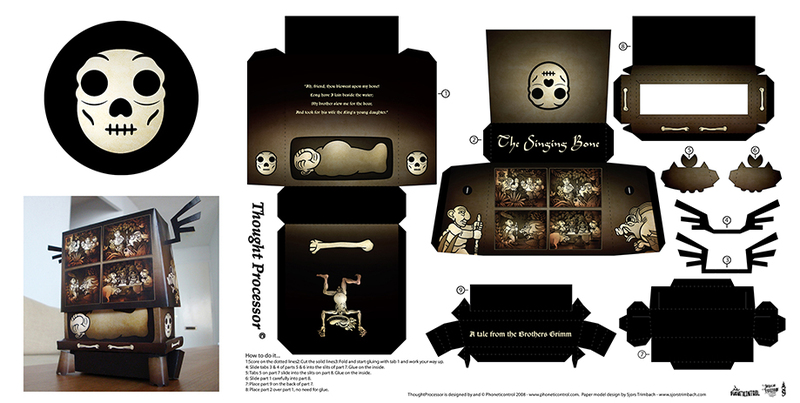 A week before the deadline for the Thought processor, the back of it still needed to be created. That is when I drew the skull that has since became a logo for the project. I created it in one evening, from beginning to end, and it is the one thing that everyone focused on when I completed the project. The four small drawings that I had accumulated in a year had potential in the line work but they were coloured awkwardly. Upon showing the final product, the skull received all of the attention and I drew it in one night. It was based on the head of the character of Simpleton and I planned to draw the rest of his skeleton later on. I learnt an important lesson with that skull of ‘letting go’. It’s process that I am still working on. I became overly concerned over small details that few people would even notice. In truth, I probably would have received better results if I had continued to work quickly and without too much restraint, but I could not help it. As it was, it would take me hours to create a drawing that a ‘real’ cartoonist or illustrator would do in 5 minutes. I would hurt myself a lot with this thought. I would zoom into the drawings in photoshop and smooth out the lines as much as I could, despite the fact that I would then redraw everything in Illustrator afterwards. Using vector illustrations was a way of compensating for what I perceived to be a lack of talent and a growing insecurity. I had not drawn much in recent years and I was doubting myself. These computer softwares were a cushion and a way of enabling my desire to create in a very controlled environment. 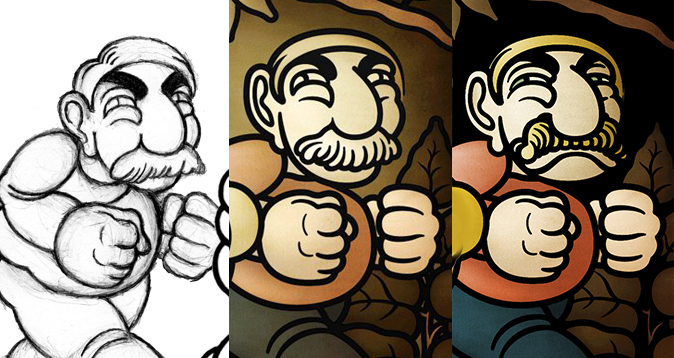 The above drawing shows the evolution from paper, to Photoshop, to one year later when I tried redrawing the face again and going through the same process. Some improving, but I have long ways to go to get to the point that I hope to be. Strangely, every step of the way, I’m aware of a quality in the drawings just enough to to convince myself to keep going and move forward. There always comes a point in the future when I look back and wonder what quality I saw in the drawings in the first place that led me to pursue the project. After all, my more realistic work was still getting more attention. My state of mind was summed up well by a friend in their message to me in December of 2012. “I hope you start putting yourself back into the equation. Art is all about self-expression and you’re cheating it (i.e. Art) and yourself if “you” are not in what you create – which I’m sure you already know. But, you have to be ready and willing to see what comes out – I’ve shocked myself in the past with some of the things I’ve sketched. But, all of it represents my emotions, which are commonly very raw and obvious in my creations. My love for Tintin extends to my very early youth. My respect and love for Herge continues to this day. When deciding on a colour scheme for Simpleton, I settled on the colours used for Tintin in some of his earlier adventures. 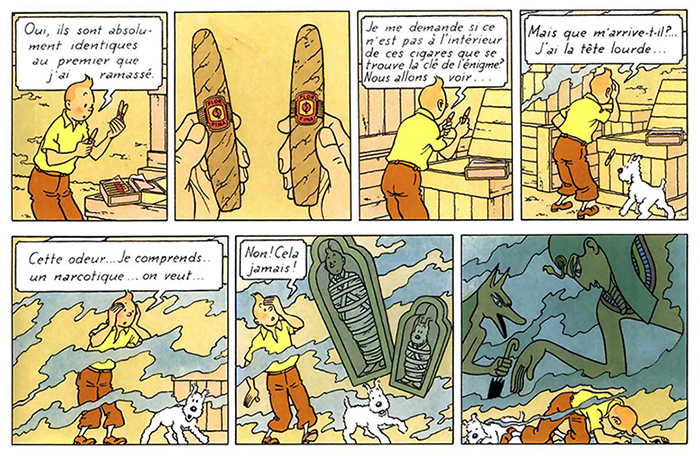 I always liked the way he was depicted in stories like “Les cigares du pharaon”. Instead of using a young heroic look for the character that I wanted to create, I opted for an older, chubbier figure and not typically heroic. Tintin was recognized for his hair and I made sure to make my hero bald. I didn’t want his white socks to be showing, I felt the reference would have become too obvious and distracting. Still one could say that Simpleton developed, in part, out of a reaction to Herge’s drawings of Tintin. I was never good at colouring. It took me a while to admit that to myself, but it was an important realization as from there I could try and improve. Upon receiving some feedback from wife, I eventually changed the backgrounds to a very dark colour, mostly black, which activated the lines and movement of the work, making the scenes more legible and quicker to digest. I needed to embrace the cartoon aspect of these drawings, and I was finally on my way. When I was younger, for reasons that I won’t pretend to understand, I was obsessed in creating a story that revolved around the hostile relationship between two brothers. As the years went by and the lack of confidence in my writing ability grew, I let the story go, but for some reason the idea of ‘two brothers’ stuck with me. Perhaps, in part, it’s simply because I have no brothers of my own. I was free to delve into the feelings about ‘family’ that I was struggling with without having to worry that someone close to me might project themselves into it. But I also think that the Singing Bone interested me because of its bleakness. The true hero dies. The villain dies. The family is destroyed, torn apart, and no real revenge is obtained by the hero. Rather, we are left with more acts of hatred in what may seem like poetic retribution, long after the hero’s passing. ‘Justice’ would be served as in most fairy tales, but it is a victory that Simpleton cannot savour. The individuals do not prosper and there is no real happily ever after, unless we are satisfied with the idea that the world has been freed from a lie. Instead of focusing on writing, I wanted to turn my attention to my drawing and put the limited amount of free time I had into that instead of splitting it between drawing and writing. I was not happy at my day job and I fantasized about transitioning into illustration. I was inspired by children stories (the old ones, like the tales collected by Brothers Grimm) and I thought that I could develop a portfolio around that. The publishers I had visited liked to get a better sense of an artist’s abilities in telling a story through a few drawings, and in the Singing Bone I had found the one that I was going to focus on in creating my portfolio. My need to be practical in choosing which project to focus on was fighting against my need to explore very dark ideas and feelings. I first started working on the Singing Bone in the summer of 2009. It has been a love and hate relationship ever since. I remember first drawing the main character of Simpleton late one night when I was very tired in my apartment in Cote St-Luc. My first instinct was to wait until the next day when I would hopefully be more awake but I’m glad that I went through with it anyway. Some of my better drawings came when I was most tired. I was quite happy with at the time but I’ve been feeling shy about showing these early sketches ever since. I was inspired by the naive and puppet-like quality of the characters in Henri Rousseau’s paintings. Portraits and realism always came easier for me but I struggled with ‘cartoon-like’ work. yet, for some reason, I always gravitated back to comics. The subtlety that lends itself well to realism does not work so much when applied to comics, at least, not the way I applied it. I was also clearly still in my shell and carried a lot of insecurity in regards to the quality of my drawings at that time as I had spent the years prior not focusing that much on illustration at all and focusing more on my graphic design career.